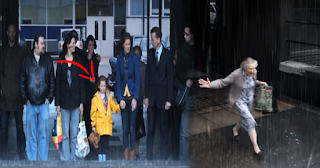 Find Out What this Little Girl Said to Make Them All Run Joyfully Through the Rain! Playing in the rain can be a lot of fun, but that’s a sentiment a bit more common among people that haven’t yet reached middle school. For the rest of us, rain is nature’s way of expressing to stay home and make it a Netflix kind of day. Most people aren’t too fond of being out. Your car’s parked about 100 meters away? Better wait it out under some shelter, lest your hair get winded. Often in our life, we need to be reminded that things aren’t bad as what they seem. We forget to soak up the moments that are given to us, and to never take anything for granted – like the feeling of rain against our skin. In the video, when the little girl asked to run through the rain, everyone thought it was just silly. But what she said at 1:47 reminded them all that true wisdom is so often found coming from the kids. The director of this short film entitled “Light Rain” wrote, “This film was based on a true story (written by Bob Perks) and the premise of it is very simple. Let’s leave the umbrella behind and enjoy every moment!